and is proud of her accomplishments and so am I. She inspires me to keep learning and I love watching her grow. At 9 years old I see signs of her slowly moving into puberty. It seems so early to me but the signs are there which cannot be ignored. I learn so much from her and she gives me the gift of self-reflection and growth. As Zoe gets taller and her mind develops I am reminded of me as a little girl and how confusing the world can be. I am reminded of me and my own mother's relationship which was rather fragile. I am doing my best to stay grounded and be there for her emotionally. It is so easy to be physically there but to be emotionally present is a gift that I must aim to give. We had lots of goodness on Good Friday, our early morning brought us delving into decorating boiled eggs which we later gave to our family who came over for supper. Here is a little tutorial on how to make natural dyed eggs. It is so fun and easy. Use beeswax crayons or crayons and colour your hard boiled egg. Watch as the heat of the eggs melt the wax when applied. We used egg cartons to help us hold the hot eggs. 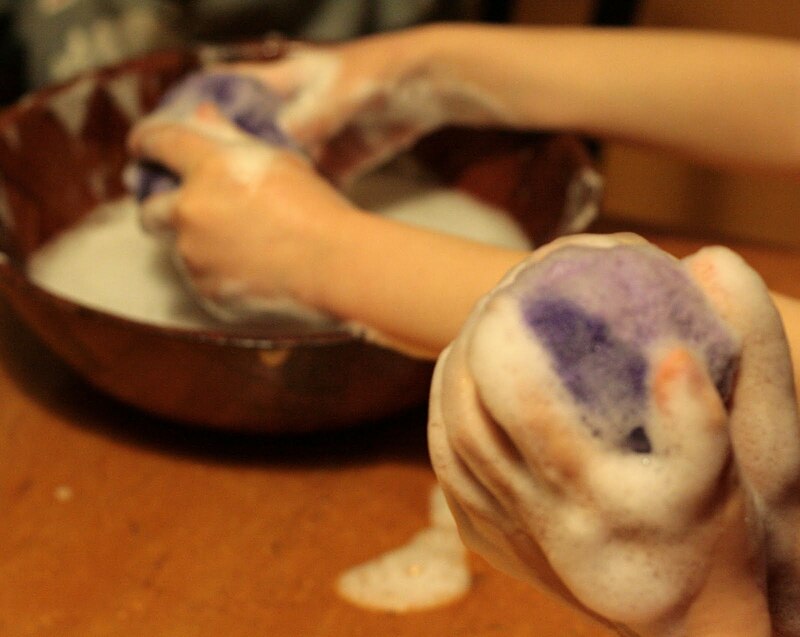 To make natural dyes we boiled 3 separate pots of water with 3 tablespoons of white vinegar. For yellow we mixed Tumeric in one pot, coffee for brown and blueberries for blue. We let them soak until they turned into our preferred colours. Our project finished with hiding our gems around the house for our guests to find. Since they were made with everything natural some people decided on eating them! Happy Easter! May you have a hoppy good day! 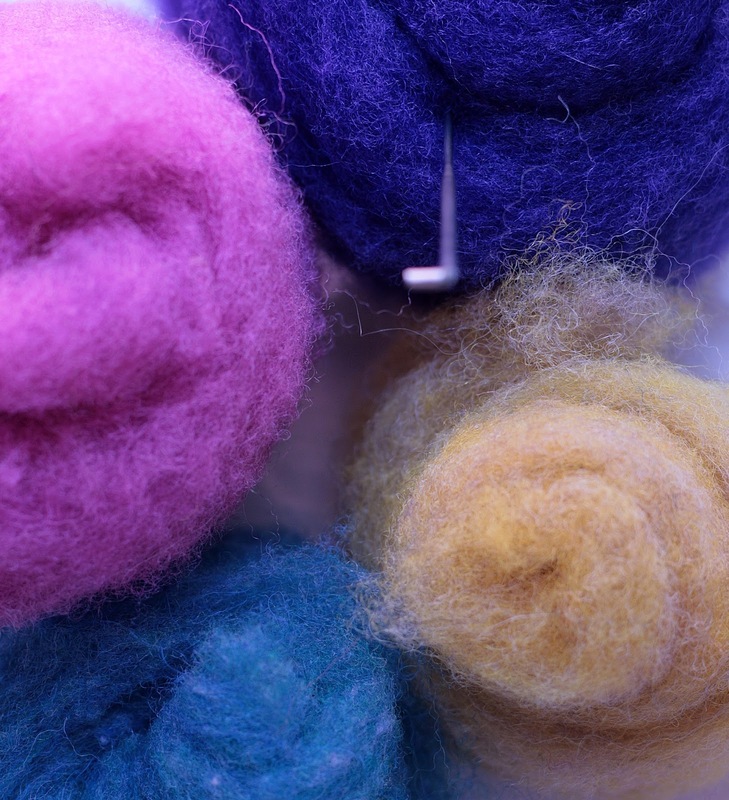 This plant dyeing party will be a great introduction to experience the wonder of plant dyes. We’ll be making dye vats from roots to create an array of colours from yellow to pink to indigo blue. Treat yourself to an afternoon with like-minded people and dye silk scarves with natural plant dyes. 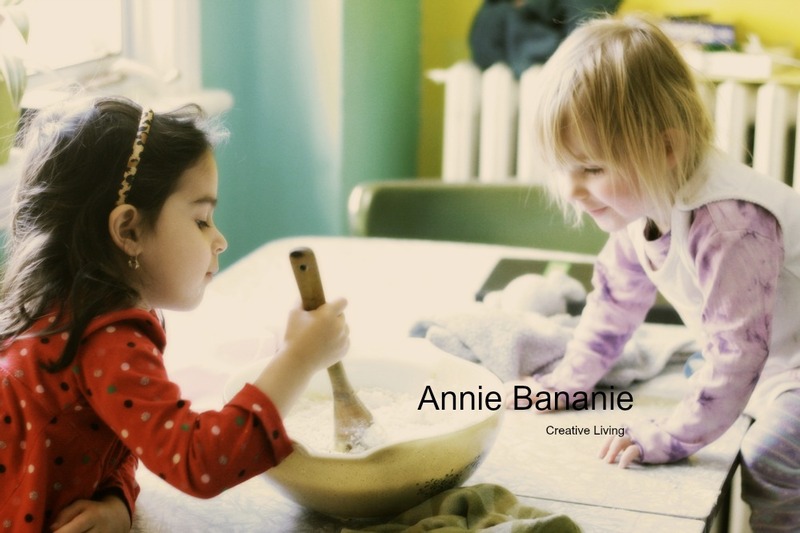 These scarves can be used to accent your outfit, to decorate a room or as play silks for your child to play with. 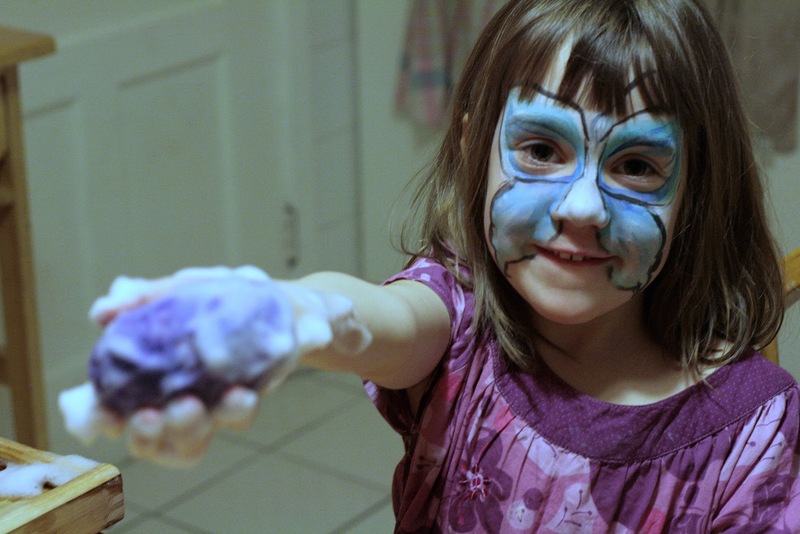 These dyes are safe and non-toxic producing beautiful colours that you will love. 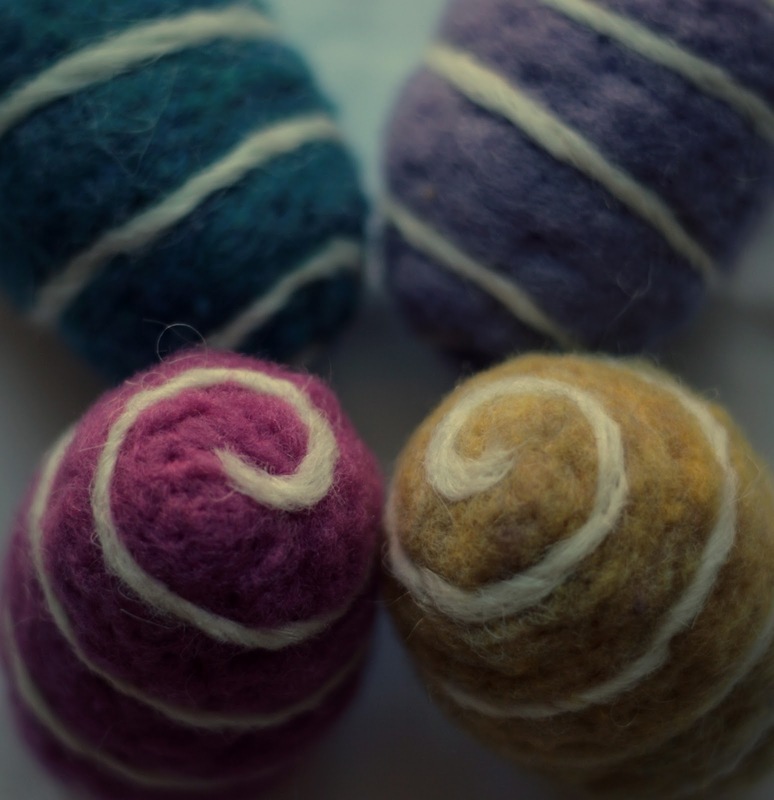 You can also use one of the scarves for the nuno felting workshop on June 12th. Cost: $ 50/ includes 3 Habotai silk scarves, tea and light snack. Make spring come to life with these cute fairies. You can surprise the children in your life by decorating your nature table with fairy love. As fairies sprinkle their fairy dust seeds begin to sprout and push through the earth. These also make great gifts for decorating a child’s room. 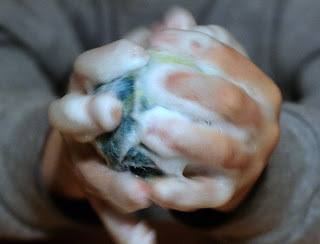 Nuno Felting is a technique developed by Polly Stirling from Australia. “Nuno” is the Japanese word for “cloth” and nuno felting is the process of binding loose wool fibres onto a silk chiffon scarf (size 14” x 72”). The result is a stunning scarf that you can wear or give to someone special. You will be so proud of your results and leave feeling very creative. There is no experience needed only a smile. Your Investment: $ 50 / includes: a hand-dyed silk chiffon scarf wool fibres and light snack and tea. I try not to complain about the weather but today mother nature has me frustrated. I am yearning for those hot days where we slip our shoes on and find ourselves outside in the hot sun. So maybe today I am feeling a little wet from the cold rain and feeling like I want mother nature to speed things up. All that said we have had some nice days where we were able to eat outside. I love eating outdoors not only because the kids love it but because it makes clean up time that much easier. All the crumbs can be left on the floor for birds, squirrels and other little creatures. Thank you for what you've done. We end our prayer by raising our hands in the air with an exclamation of: "Blessings on our food!!!" Do you have any rituals you'd like to share? 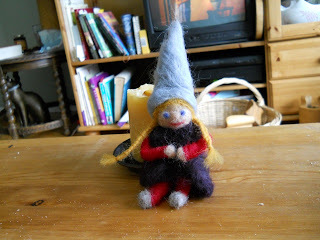 Tonight I am hosting a birthday workshop for a felting friend. 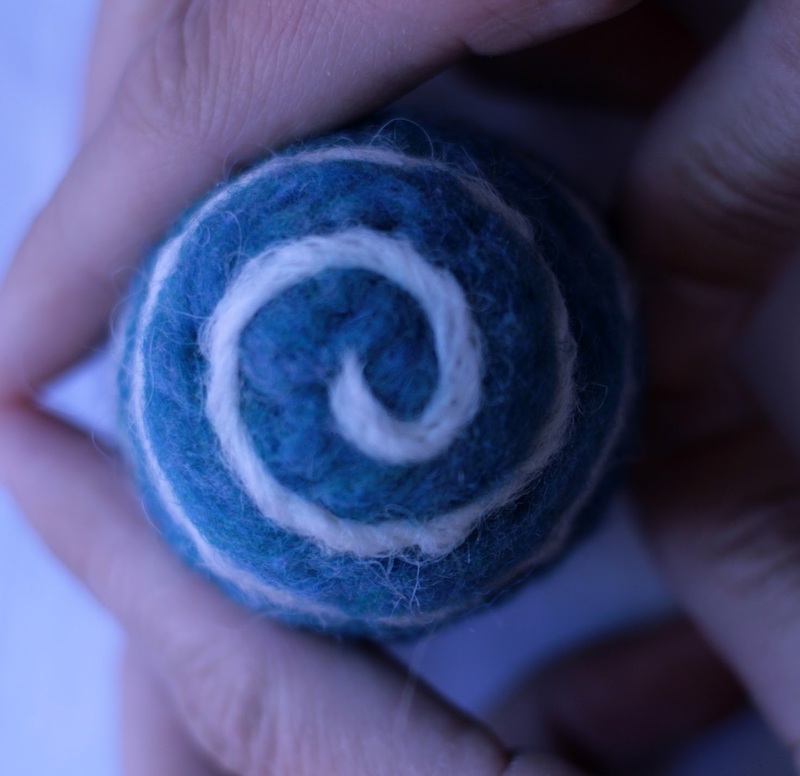 Ann attended a workshop in the fall and fell in love with the art of sculpting wool into cool stuff. Her love is so deep that she wanted to celebrate her birthday with friends at a personal workshop. So tonight we are gathering with needles in hand and wool as our medium. It is sure to be a good time. 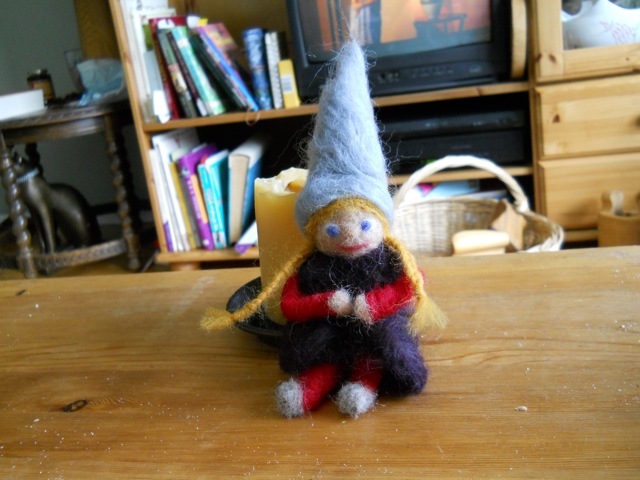 Here is a little elf that she has felted. 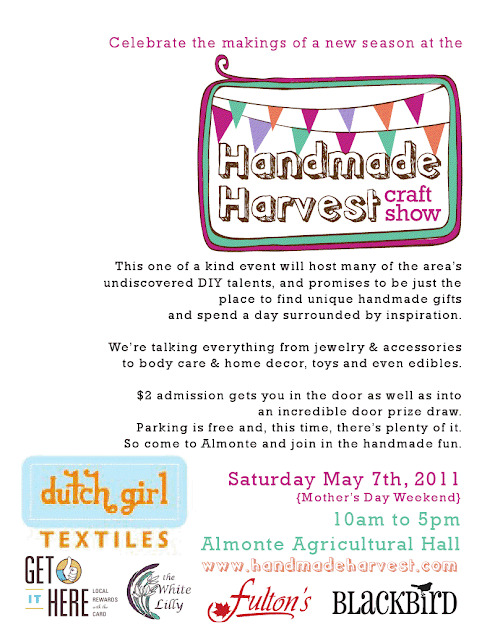 Handmade Harvest is less than a month away and I have promised myself not to leave things until the last minute. I have concrete memories of procrastinating until 2 weeks before a show to find myself scrambling and stressing out. In order to attain all that I want to make I have given myself weekly goals. This week I aim to finish my moon dolls. These dolls stand about 5 inches tall and are meant to sit in an inspiring spot in your home. They are totems that evoke different characteristics. Please, let me introduce you. Meet Little Miss Sunshine who brings in the light of the outdoors and casts a warmth to any room. Her glow spreads through every dark corner. She evokes happiness and like the sun that brings new growth she evokes that in others. Here is Earth Girl, steady, strong and grounded within herself. She knows where she is going and feels confident in who she is. She symbolizes the strength that lives within all of us. This white haired blue dressed woman is called Wisdom of Life. She has a wealth of experience and is wise beyond her years. To look at her you realize that all the answers you are looking for are within you. I hope you find these as cute as I do. After spending so much time felting these dolls into form, I fell very invested in them. Each doll comes with it's own card featuring the doll and her characteristics making it a great gift. If you are a woman I suggest you watch the video below. What a great message! On June 6, 2011, Full Circles Ottawa is having a 'Really Really Free Market'. This is a garage sale where everything is free. Full Circles is a group that promotes the free-recycling of used items in an effort to reduce waste in our city and society. They have offered Brian and I a table so we can chat with people about Project: Priceless (free wedding experiment), and collect donations (ie. fairy lights, linens, paper plates...things we still need) at our table. 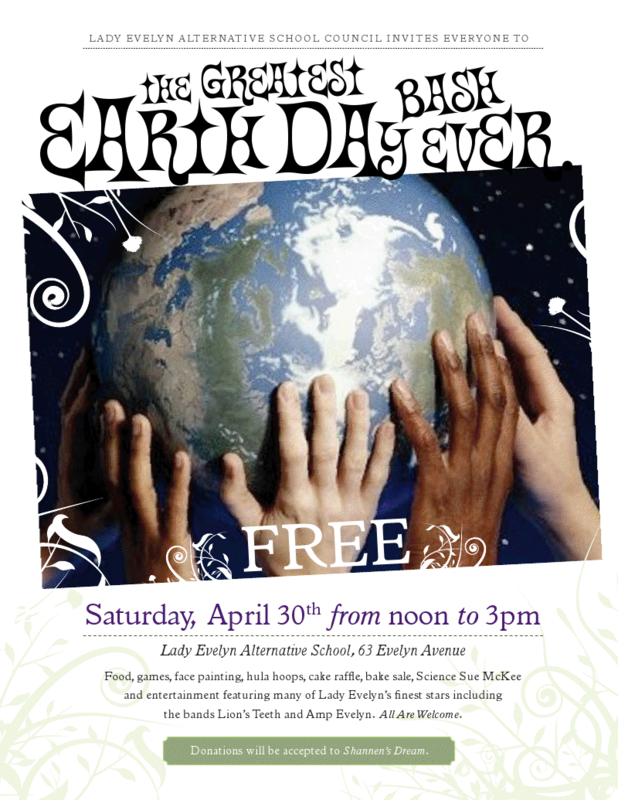 I have just spoken with them again, and they would like to invite any/all of you lovely folks to have tables, too. The market is free, so you can't be selling anything, BUT you can have a table where people can learn more about your business, and if you have free samples to give away, that's strongly encouraged. Also a daycare mom let me know that a Bridgehead is coming to my street, nearly just across the street!!! Oh! My this is dangerous for me. We've been doing some cleaning and creating around here. Our back play room has been transformed into a magical forest. Jacqui and Zoe painted a great big tree, sun, stars and moon. It transformed the whole room and looks so beautiful. I love how the tree sits in the corner. Zoe felt so proud to be able to be part of the art work. I was proud of her too. She is growing so fast and lately I have noticed a leap in her development. She knows where babies come from and astounds me with her views on life. In fact this weekend she told me that she registered us for the talent show at her school! In a couple of weeks I will be on stage hoola hooping with my daughter!!! I can't believe it. I've been practicing like a mad women. It's been a great bonding experience for us. Zoe chose the song "Fireworks" by Katie Perry to hoop to. I am quite enjoying this adventure. This is Jacqui painting stars and she is a star herself. I love working with her, she just shines. I must say that the women I work with are most fantastic and a good vibe lives here. Owen painted the outside fence different colours. I must admit that last night's rain did wash most of the colours out. He is also growing fast. Today being Monday we got ready for our week by grating cheese, washing apples and pears. I am loving this weekly schedule as it really helps us out during the week. Apples all washed and ready for a good munch, cheese all ready to be sprinkled over pizza, pasta and whatever else takes our fancy. Working like a team is a great community feeling. When lunch is finished each child scrapes their left over food into the compost bin. They really do love helping out. It makes them feel good about themselves and part of our team. We've been busy, busy, busy! 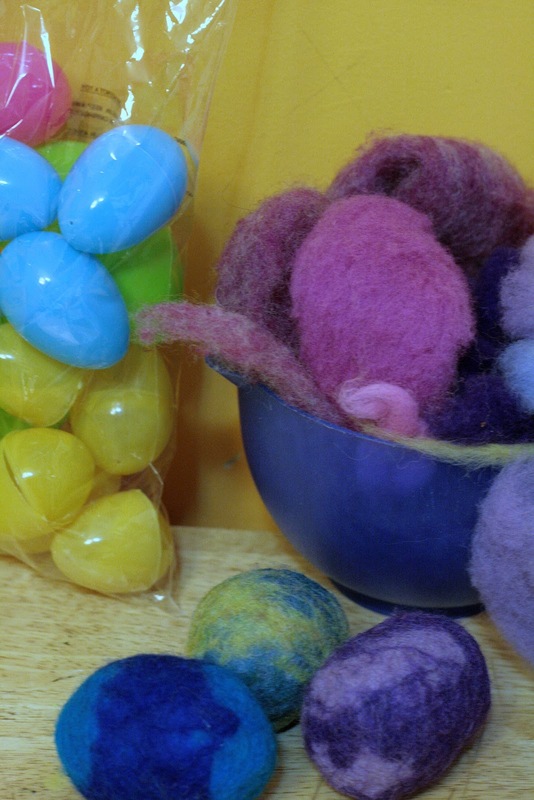 Busy as a hen :) For the last 3 days we've been making wet felted Easter eggs. When in their completion they will be hollow and a great little place for little surprises and messages. 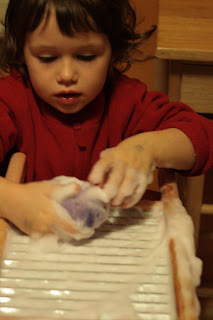 The children are enjoying playing with soap and water as the wool hardens into felt. I am working on a tutorial for this great, fun craft but in the mean time here is a video tutorial of young Max felting an egg. He uses a differnt technique with different results but fun all the same. On a personal front I am working hard to get an owl, butterfly and fairy felting kit together for Handmade Harvest an artisan show on May 7th. Stay tuned lots is going on in my little workshop. Easter is just around the corner. The tradition of finding eggs hidden by the Easter Bunny is a tradition found in many homes. In the pagan tradition the egg symbolizes the rebirth of the Earth. In Christian traditions it represents the resurrection of Christ. Whatever your spiritual beliefs, I am sure you can feel the magic in the long days, the budding trees and new growth. This time of year brings feelings of new beginnings and a revival of the spirit. Here is a tutorial on felting your own Easter eggs. Get the whole family to join in :) It's always fun to gather and work together. Bonita Ford will be giving the following workshop here in the red room. Reiki is a holistic, light-touch, energy-based modality that helps promote balance, relaxation and well-being.